Home » Website Building » WordPress » How to Remove Proudly Powered By WordPress Footer? How to Remove Proudly Powered By WordPress Footer? We have created this article years back for Twenty Fourteen theme, now updated with Twenty Seventeen and Twenty Sixteen examples. Basically all default themes are coded similar up to Twenty Sixteen but the latest Twenty Seventeen works differently. So the Twenty Sixteen example can also be applied to older default themes like Twenty Fifteen, Twenty Fourteen, etc. 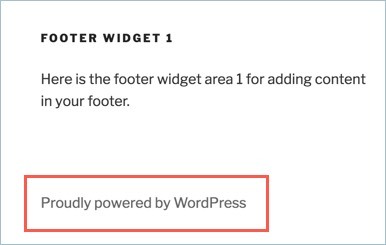 WordPress displays the footer message “Proudly Powered By WordPress” using a CSS class named “site-info“. You can see this class by right clicking and inspecting the footer element. 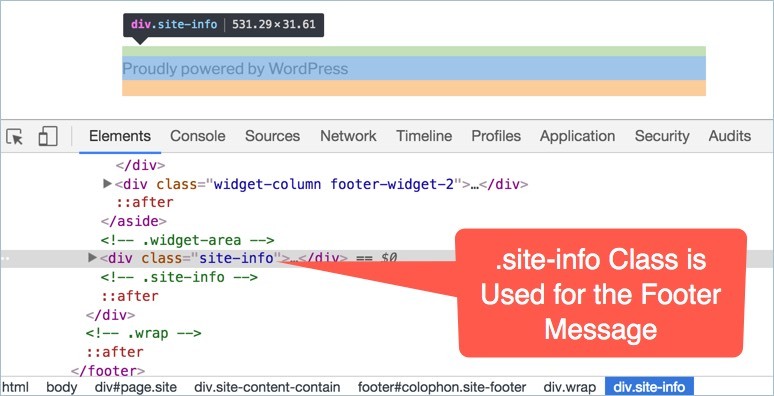 Now that you can simply hide the footer using the “site-info” CSS class as explained below. Login to your WordPress admin panel as an administrator and navigate to “Appearance > Editor” menu. Click on the “style.css” file located nearly at the bottom of right sidebar under “Styles” section. 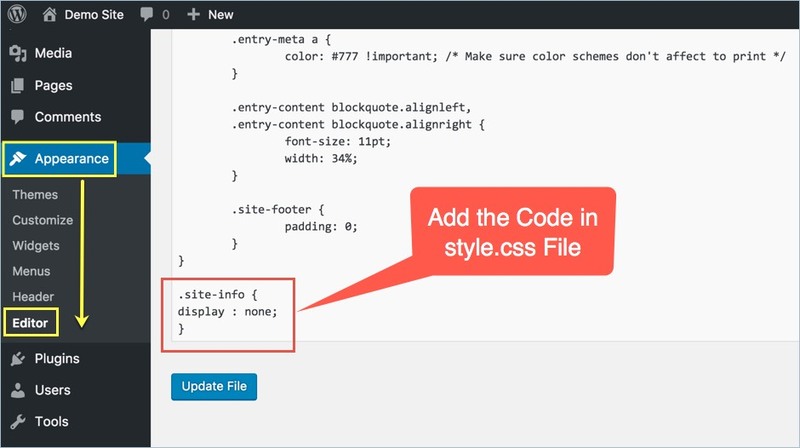 Add the following code at the end of “style.css” file and click on “Update File” button. View your site in a browser and the footer message “Proudly powered by WordPress” is hidden now. 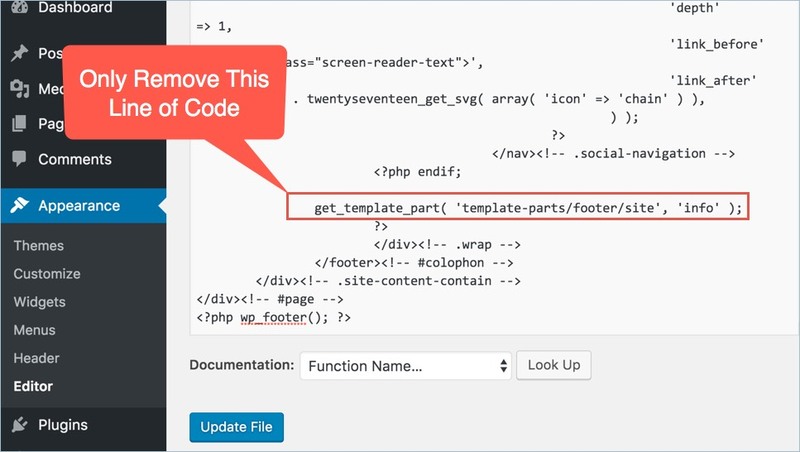 Above method will only hide the footer message and the actual message will always be there in the template PHP file. Also search engines like Google don’t like site owners to hide the links. So the better method is to modify the source PHP code in “footer.php” file to remove the footer. Default themes up to Twenty Sixteen works in a similar manner but the Twenty Seventeen theme works differently. Here we will explain both cases. Note, you need to use theme editor in order to modify PHP files and you can’t use customizer. If the theme editor is disabled on your WordPress admin panel then the only way is to use FTP and modify the file. Remember the modifications on the PHP file will be wiped off on each theme update. You need to update the “footer.php” file after every theme update or use child theme to avoid this. Navigate to “Appearance > Editor” and select “footer.php” file from the right sidebar under “Templates” file. Locate the below block of code and remove it completely. Click on the “Update File” to save your changes. View your in a browser and the footer message should be removed now. You may need to clear browser’s cache for the changes to be effective instantly. On Twenty Seventeen theme, you need to remove the below code from “footer.php” file. Update the file and check you site on the browser, the free footer message should be removed. On Twenty Seventeen theme add the below code in your “footer.php” file. You can add multiple links and decorate them by adjusting the CSS. Is it Legal to Remove the Footer? So, in our opinion we do not see any issue in removing the footer code. Would this survive an update to the Seventeen theme? I don’t think so. I think we need some PHP code to put in a child theme’s functions.php file. Nowadays the theme files are changing to a partial templates. Let us wait for some more time till twenty eighteen theme and we will update this article. 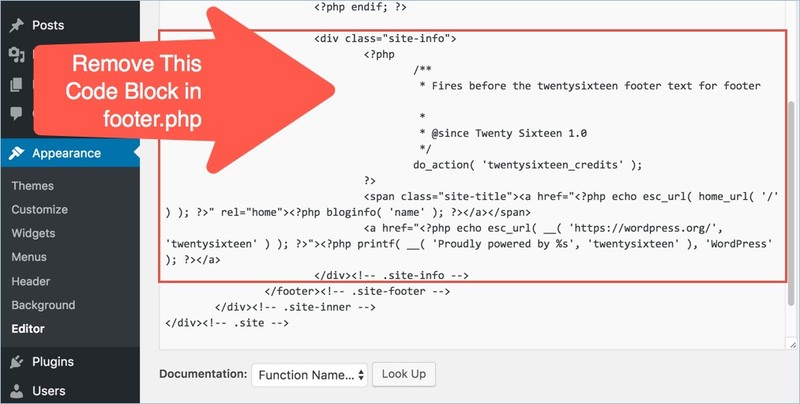 You should look for “Inc > hooks > footer.php” file in the theme editor. Scroll to the bottom to find and remove the message. Nice! I didn’t mind it but then user was clicking on it was since it didn’t open in a new/window, it has to go. Thank you so much for the crystal clear instructions! I was able to remove the footer without issue, which is important to my super simple interface. You rock! Thanks for the wonderful tutorial. I will be using the child theme instructions tomorrow! I particularly appreciate that you updated it for the current default theme. Can we “hide” footer text “Powered by WordPress” at the bottom of WP theme by change a color font to become same with background page ? In order not to break the WP rule. Thanks. Hiding with color or using smaller font sizes are black hat SEO methods, search engines can still find those links. There is no WP rule saying you should not hide the footer, doing so with CSS will not make any difference for that mater. WordPress, Twenty Seventeen and most other free themes are distributed under GPLv2 or later which allows you to redistribute and/or modify the code (as far as we understand). Thank you for a straightforward and easy to follow tutorial that actually works! This is the best way to remove footer text from wordpress website. How can we remove footer text from wordpress hosted blog? Hi there is no edit option on my menu so I can’t access to put in or edit code. Iv search all over my site It’s not there. Do sent matter what theme I’m using its never there. The theme and plugin editors can be disabled by modifying wp-config.php file. Either you might have modified your config file or you are using a security plugin to disable the editors on admin interface. If you disabled it then it will not appear unless you reenable it regardless of the theme you use. Never thought this simple phrase “Powered by WordPress” could become a problem. Thanks for the informative article. It really helps. Thanks,it does help me a lot!! Thanks ! this is really works ! 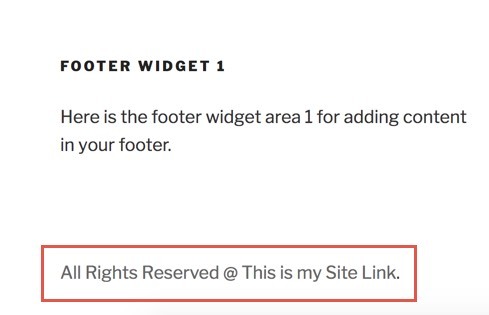 Powered by WordPress footer message is an easy identification for hackers to find WordPress site using default themes.WordPress does not allow to remove footer message but there are 2 methods to follow it’s either hide or remove it from site .